Years ago, I worked at a small daily newspaper that, like all small dailies in that neck of the woods, produced an annual supplement called “Fall Colours”. The supplement, depending on the state of the economy, could run many pages, supported by local retailers anxious to convince people that the holiday shopping season begins the minute the leaves start to change. Too bad it was in black and white. 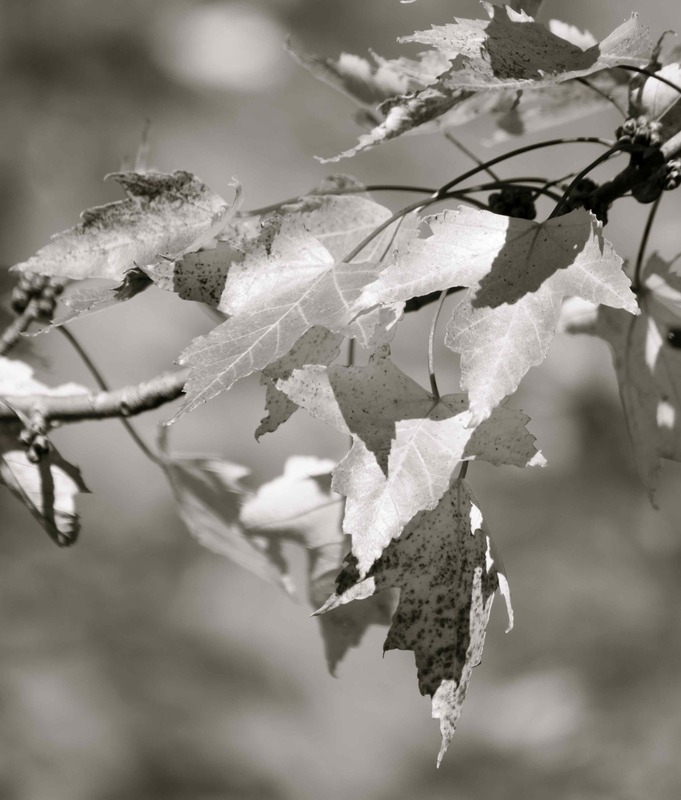 Page after page of autumnal scenes, all in shades of gray. The actual “fall colours” were left entirely up to our readers’ imaginations. (For our Christmas Lights special the photographers had to search for trees and houses with only white lights so they would display well in black and white.) Somehow, it worked. I still smile at this (almost two decades later) every autumn as I drive down a country road lined with maples in shades of fiery red and yellow. Our cottage is in the heart of a county famous for its maple syrup and the woods there are engulfed in the bright yellow of the sugar maples that dominate the forest. A little treat to be thankful for before the long, gray winter ahead. 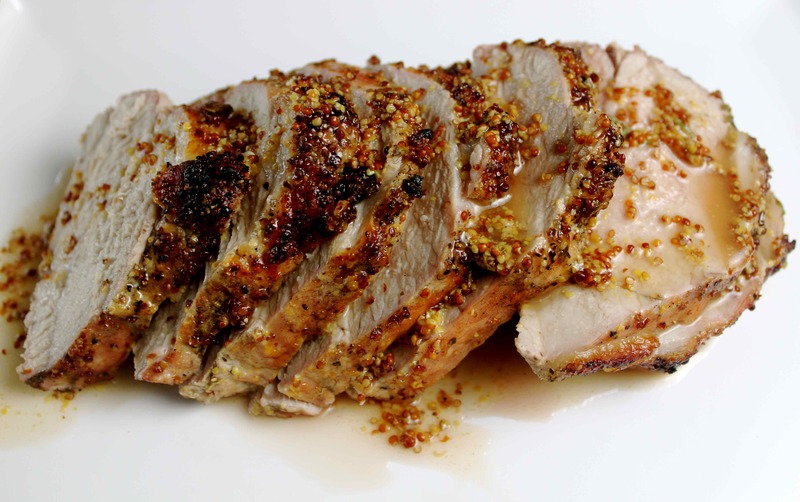 This tender pork roast, grilled on a maple plank that gives a hint of smoke and finished with a tangy cider vinegar and mustard glaze sweetened with maple syrup, is perfect for a fall day full of leafy colour. Soak the maple plank in water for at least two hours. Preheat gas grill to high on one side, medium on the other. 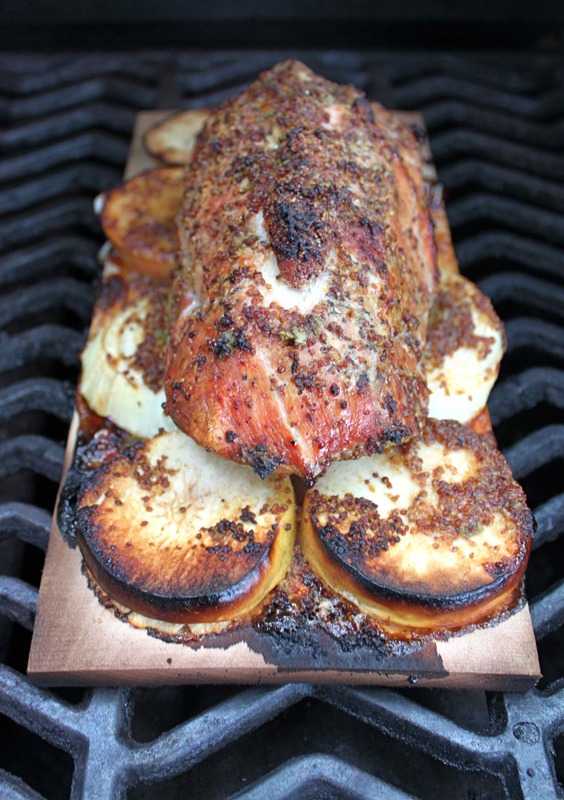 alternate onion and apple slices on wet plank and place pork loin on top. Season with salt and pepper. Place plank on the medium side of the grill and close lid. Cook for about 1-1/2 hours or, until a meat thermometer inserted into the middle of the roast reads 160 F.
While pork is cooking, mix glaze ingredients together and use to brush pork several times in the last 30 minutes of cooking. Discard apple and onion slices. Pour additional glaze over sliced pork and serve. Enjoy. This entry was posted in Barbecue, Condiments and Sauces, Main Courses, Meat and Poultry and tagged autumn meal, barbecue, BBQ, glaze, main, maple, pork, smoke. Bookmark the permalink.